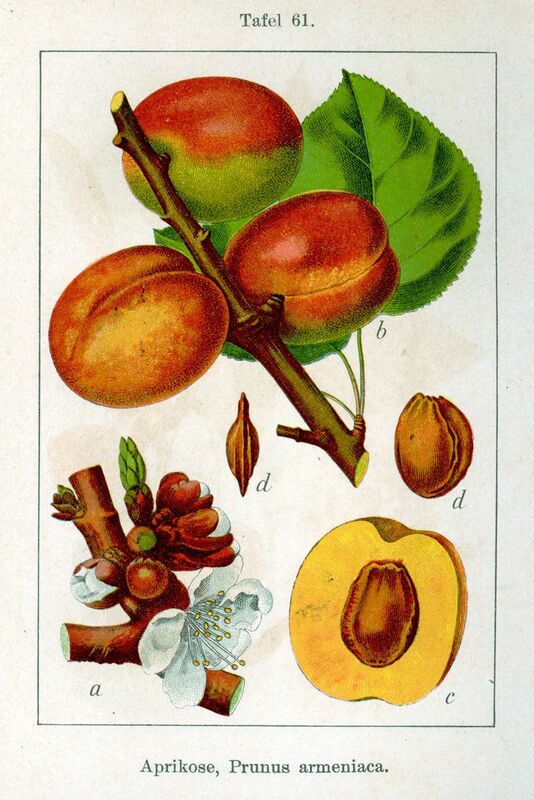 Prunus armeniaca (“Armenian plum”), the most commonly cultivated apricot species, also called ansu apricot, Siberian apricot, Tibetan apricot, is a species of Prunus, classified with the plum in the subgenus Prunus. The native range is somewhat uncertain due to its extensive prehistoric cultivation. “Cet arbre tire son nom de l’Arménie, province d’Asie, d’où il est originaire et d’où il fut porté en Europe …” (“this tree takes its name from Armenia, province of Asia, where it is native, and whence it was brought to Europe …”). An archaeological excavation at Garni in Armenia found apricot seeds in an Eneolithic-era site. Despite the great number of varieties of apricots that are grown in Armenia today (about 50), according to Vavilov its center of origin would be the Chinese region, where the domestication of apricot would have taken place. Other sources say that the apricot was first cultivated in India in about 3000 BC. It is said that its introduction to Greece is attributed to Alexander the Great; later, the Roman General Lucullus (106–57 B.C.) also would have imported some trees – the cherry, white heart cherry, and apricot – from Armenia to Rome. Subsequent sources were often confused about the origin of the species. Loudon (1838) believed it had a wide native range including Armenia, Caucasus, the Himalaya, China, and Japan. Apricots have been cultivated in Persia since antiquity, and dried ones were an important commodity on Persian trade routes. More recently, English settlers brought the apricot to the English colonies in the New World. Most of the modern American production of apricots comes from the seedlings carried to the west coast by Spanish missionaries. CultureGrams 2002 – Page 11 by CultureGrams. VII Symposium on Apricot Culture and Decline”. Actahort.org. Retrieved 2012-06-22. De Poerderlé, M. le Baron (MDCCLXXXVIII (1788)). Manuel de l’Arboriste et du Forestier Belgiques: Seconde Édition: Tome Premier. à Bruxelles: Emmanuel Flon. p. 682. Downloadable Google Books.B. Arakelyan, “Excavations at Garni, 1949–50” in Contributions to the Archaeology of Armenia, (Henry Field, ed. ), Cambridge, 1968, page 29. B. Arakelyan, “Excavations at Garni, 1949–50” in Contributions to the Archaeology of Armenia, (Henry Field, ed. ), Cambridge, 1968, page 29. Huxley, A., ed. (1992). New RHS Dictionary of Gardening 1: 203–205. Macmillan ISBN 0-333-47494-5. Loudon, J.C. (1838). Arboretum Et Fruticetum Britannicum. Vol. II. London: Longman, Orme, Brown, Green and Longmans. pp. 681–684. The genus is given as Armeniaca.